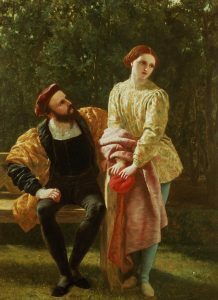 In a belated celebration of Shakespeare’s 453rd birthday, we’ve been taking a look back over some of his most iconic couples. Some of them were inspirational and uplifting – relationships which have stood the test of time, remaining relevant some centuries after their creation. And some stabbed each other, stabbed themselves, stabbed their friends and ruined major nation states through incomprehensibly bad decisions. 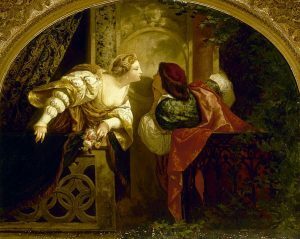 Read on for our entirely biased, completely arbitrary ranking of Shakespeare’s best romances. Oh, and a few dishonourable mentions. In a play stuffed with ridiculous love triangles and gender switcheroos, this couple stands out as being both fairly sensible and very time efficient. While everyone else runs round cross-dressing and sticking things to trees, Touchstone the Fool woos Aubrey the goat girl in about three pages of dialogue and both are thoroughly content with the outcome. Afterwards, he very sweetly promises to kill a rival “a hundred and fifty ways” if he tries anything dodgy. Ferdinand is probably also rubbish at chess, but he’ll be very nice about it. A man so attractive that he makes Miranda hit puberty on the spot, Ferdinand is also sort of endearing in how pathetic he is. He is hopeless at all of the really heroic stuff he attempts – swordfighting, log carrying, standing up to anyone at all throughout the play – but he makes up for it with being so genuine and kind to Miranda. And she is every inch his equal, with an excellent sense of humour and a superhuman ability to carry timber. They’re in it for the long run. You know what they say – couples that gouge together, stay together. At least until he’s (SPOILER) assassinated by a servant who’s not such a fan of the gouging. But Cornwall stands by Regan when she’s having some family issues, and she is every bit his equal in the political realm. And it’s nice to share hobbies, even if the hobbies are a little grotesque. They lose points for Regan hitting on someone else before Cornwall is even properly buried, but while they were together, they were an unstoppable force. They only really get one scene together, but this pair are an example of triumphing over adversity. In this case, the adversity is that he’s just killed thousands of her countrymen – probably a few of her relatives too – and disinherited her entire family to make himself King of France. But hey, they find a way to work around that, and even conquer the language barrier caused by all English people being dreadful at French to make this list. She did make a very pretty boy, after all. Both hilarious and bizarre, this is the most touching section of the tangled love web formed in Twelfth Night. She’s in love with him but can’t tell him because she’s dressed as a man and she’s trying to woo someone for him. He’s in love with someone else but she’s so attractive even as a man that he starts to question his own sexuality. Plus, it spawned the best romcom ever made about football and cross dressing. These two scrape into the top five on the basis that they clearly do care about each other, even if they’re utterly awful at being together or expressing how they feel. 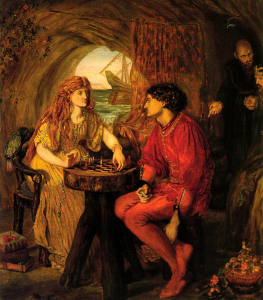 But the best breakup scene in Shakespeare, followed by some truly moving scenes after (SPOILER) Ophelia drowns herself, give these two a spot on the list. Even if she spies on him, he stabs her father, they both go a bit mad and neither actually declare their love to each other. It still gave Shakespeare the chance to make the best genital related pun on record. Aesthetically pleasing but not at all Health and Safety approved. They may be borderline hysterical, hasty and hopeless at forward planning. But they’re iconic for a reason, and it gave Shakespeare a chance to write some of his most famous and beautiful love poetry. Critics have argued whether or not it was intended as a warning about irresponsible young love, but either way the story is a tear jerker. Bonus – it’s been ripped off by everyone from cheerleaders to vampires to High School Musical. He’s weak and indecisive and takes advice from strange women with dodgy potions. She’s cold, power hungry and obsessive about cleanliness. Together, they commit treason, homicide and an array of other crimes before being brought down by an army pretending to be trees. Yes, they come to a disappointing end as a couple but it’s brilliant while it lasts and after all, it’s nice to do things together. Like bring down the kingdom of Scotland. The best bickering couple in literature, these two trade insults like they’re going out of fashion. They have the benefit of being the comic relief in a comedy, but their scenes are some of Shakespeare’s best comedic writing. Admittedly, he dumped her once already, and she tries to convince him to kill his best friend; he’s awful at love poetry and they both have to be tricked into saying anything nice about each other. But no one’s perfect and they get this spot on the list for being so much fun to watch. It starts off as treasonous and a bit incestuous. It ends with most of the Danish Royal Court dead. It doesn’t really get better in the middle either. The only question with these two is why anyone thought they would make a suitable couple. She hates him, he’s scared of her, she betrays him and he can’t even muster up a little bit of sadness after she runs off and (SPOILERS) kills herself. And the best couple in all of Shakespeare? They even do nice things together! Like visit graveyards and ruin funerals. Horatio is probably the best friend in all of literature. 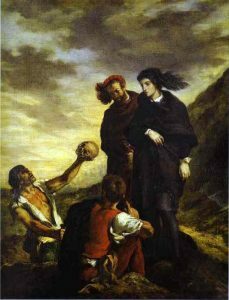 He’s supportive of Hamlet, even when Hamlet goes mad, is rude to everyone in the vicinity, puts on poorly considered plays and commits multiple homicides. He doesn’t even judge when Hamlet takes the advice of a ghost, comes back from time abroad with some rubbish about pirates and doesn’t even try to excuse sending other friends to their deaths. I’m not totally sure what Hamlet brings to this relationship other than uncontrolled verbosity, but these two are cute together, and there’s not a shred of betrayal in sight.